Author: Mark Yeager – Integrated Test & Measurement (itm), LLC, Rob Vickers – SixDOF Testing & Analysis, Inc.
We chose the high-performance and rugged NI cDAQ-9139 stand-alone system with NI C Series modules along with our LabVIEW-based data acquisition software, iTestSystem, to create a rugged, high-performance and portable exhaust test system for large vocational vehicles. 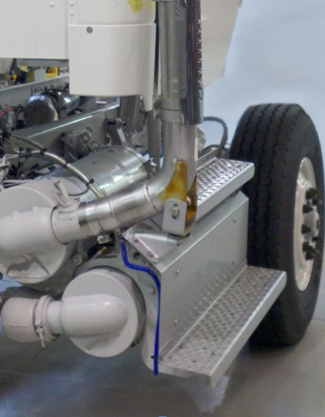 Our solution provided a wireless interface to the stand-alone NI CompactDAQ system to allow the operator remote control and monitoring of the embedded acquisition and logging system. 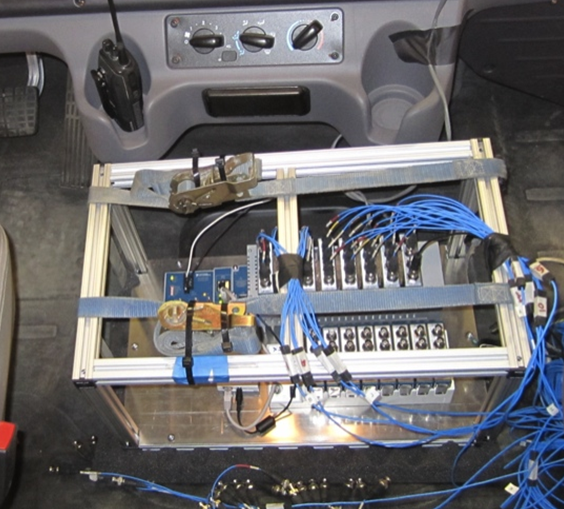 We’ve used USB and Ethernet-based NI CompactDAQ systems and our iTestSystem software, based on NI LabVIEW, for years to build high-performance data acquisition and test systems for our customers in the transportation and in-vehicle space. The stand-alone NI CompactDAQ systems provide a new line of portable and flexible hardware from National Instruments by combining an embedded processor with the modular NI CompactDAQ platform. Since these new NI cDAQ-913x systems can be used with the same NI LabVIEW system design software, NI DAQmx driver and 50+ existing NI C Series modules, we can build new flexible logging solutions for our customers in a very short amount of time. For this application, we chose the high-performance and rugged NI cDAQ-9139 stand-alone system with seven NI 9234 accelerometer modules and one NI 9229 module to interface directly to the sensors we leveraged in this application. The standalone cDAQ-9139 was bundled with a cellular network interface and packaged inside a rugged carrying case. For the sensors, we mounted 28 piezoelectric accelerometers to the exhaust system and connected them to the seven NI 9234 accelerometer modules. We also installed a magnetic pickup sensor and connected it to the simultaneous, differential NI 9229 analog module to determine rotational speed that would be used later in a post processing order analysis algorithm. We leveraged the Windows Embedded Standard 7 OS running on theNI cDAQ-9139 to make the transition from using NI CompactDAQ USB-based systems connected to a laptop or PC a seamless process. We used our iTestSystem software, based on NI LabVIEW system design software, to stream data from staged events and operation directly to the NI cDAQ-9139’s non-volatile hard drive in a TDMS file format. We were able to control and monitor the data acquisition remotely via Remote Desktop by connecting the cDAQ-9139 to a Wi-Fi network using a cellular broadband modem and router with Wi-Fi. After collecting data, all of the TDMS data files were transferred to a computer for post processing and analysis. The analysis for this project included calculating the overall vibration levels for each accelerometer using the order analysis plug-in for iTestSystem software that leverages the built-in analysis functions within NI LabVIEW. Additionally, with the iTestSystem software and NI LabVIEW, we were able to provide our customer with a professional report containing overall vibration levels and order analysis graphs that identified which sensor locations failed or met the design criteria. Leveraging the stand-alone CompactDAQ systems and NI LabVIEW and iTestSystem software for this project was a huge success. Our customer was amazed at how quickly we were able to integrate new technologies including both NI and third party hardware and software. With this system, we were also able to reduce the overall cost of their test by reducing the manpower needed to perform the test and providing them with instantaneous feedback of the system functionality by utilizing new technologies. 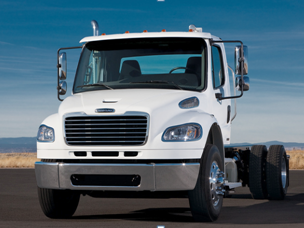 Our customer liked the system so much that instead of sending the system back to us, they redeployed the system onto another on highway vehicle to solve a different problem.